There are several different types of trapdoor for use with the level editor, but they can be divided into two groups. Some opened by a trigger and others, which Lara opens herself. Trapdoor type 1 opens upwards or downwards when triggered, depending on the wad it's from. Most can be anti-triggered or timed. The type 2 & 3 trapdoors open downwards and can also be closed again by using an anti-trigger. They can also be timed to close after x number of seconds. This is the type, which Lara will lift up to open, and does not require a trigger. Notice the rope / chains to support it in the open position. Once opened it can't be closed again. Lara will jump up and grab the handle on this door to pull it open. Once opened it can't be closed again. No trigger required. Place a maximum of 7 clicks above the floor. To avoid problems with trapdoors it is very important to place them in the level correctly. This simply involves placing them onto the floor of the lower room and raising them up into position, making sure they finish exactly level with the height of the portal. Ensure they are placed exactly in the portal because one click higher or lower will crash the level. 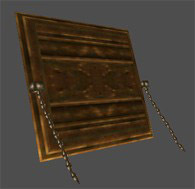 Always place trapdoors on the floor of the room below and raise them up into position otherwise they will 'disappear' disconcertingly in game when viewed from certain angles. Additionally, trapdoors MUST be placed on the highest part of the ceiling. If any other part of the ceiling is higher than the trapdoor, Lara will fall through it and level crashes could occur. Trapdoors can cause problems in flipmaps, especially with losing collision. It's best to avoid using trapdoors in flipmaps if you don't want headaches. Guardian. Was (This door opens downwards & can't be anti-triggered). * Unless otherwise stated trapdoors 1 - 3 open downwards and can be anti-triggered.